Last week Clash of the Titles held their first ever Clash of the Covers. This fast-paced clash was different than their usual fare, because instead of judging the author's story, we judged how well their cover designs matched their theme or made us want to pick up the book. There were four books to vote on, from authors Cathy, Erica, Lacy, and Maggie. 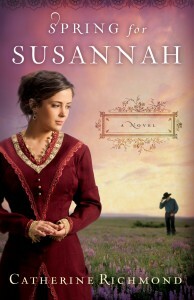 The books were Marrying Miss Marshal, Spring For Susannah, A Bride's Portrait, and Deeply Devoted. Marrying Miss Marshall seems to speak volumes about the heroine--just in her position. Marrying Miss Marshal. Hmm, with that rifle laid across her lap, one wonders who's daring enough to approach her, much less marry her. Intriguing. Love this (A) - it's intriguing. I'm not sure from the picture whether she's toting for justice, revenge, or protection. Makes me curious.